In 2010, Clowns Without Borders USA returned to Guatemala with the support of Save the Children to perform for communities still recovering from Hurricane Stan. They performed 9 shows for 3390 people. In 2008, Clowns Without Borders USA went to Guatemala to support the communities still recovering from Hurricane Stan. They performed 18 shows for 5000 people. In 2006, Clowns Without Borders USA returned to Guatemala to release the suffering of the people affected by Hurricane Stan. They performed 18 shows in different communities, for 9000 people in total. In 2006, Clowns Without Borders Spain went to Guatemala to alleviate the suffering of the children affected by Hurrican Stan. They performed 17 shows for 6938 people. In 2005, Clowns Without Borders Spain sent 3 artists to Guatemala to support the education of young people from the countryside. They performed 15 shows for 6000 people. Clowns Without Borders Spain returned to Guatemala in 2002, partnering with Casa Alianda and the Office of the social pastoral archbishopric of Guatemala. They performed 10 shows for 6000 people. In 2001, Clowns Without Borders Spain returned to Guatemala, with the support of Casa Alianda, Oficina de la Pastoral Social del Arzobispado de Guatemala, performing 10 shows for 6000 people. 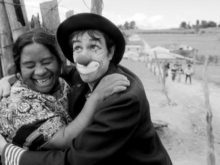 In 2000, Clowns Without Borders Spain returned to Guatemala to attend communities and neighboorhoods without any economic, educational nor cultural resources. In 1995, Clowns Without Borders Spain traveled to Guatemala to attend returning refugees.